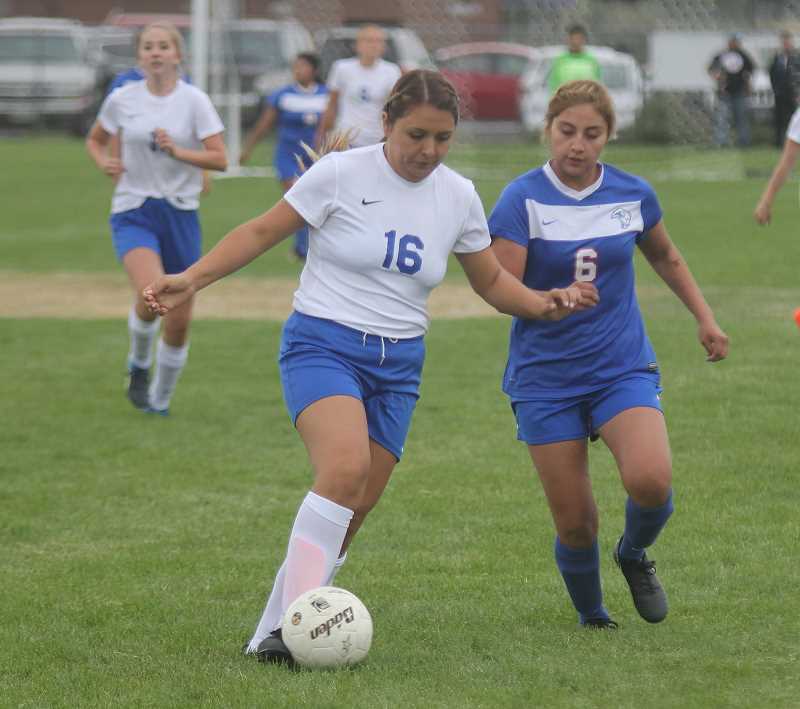 The Crook County Cowgirls tried valiantly to come back in the second half Thursday afternoon, but an early deficit proved too much as the Cowgirls fell 5-2 to the Madras White Buffalos. Crook County, which lost 9-0 to South Albany earlier in the week, played better at Madras, but still fell behind early. 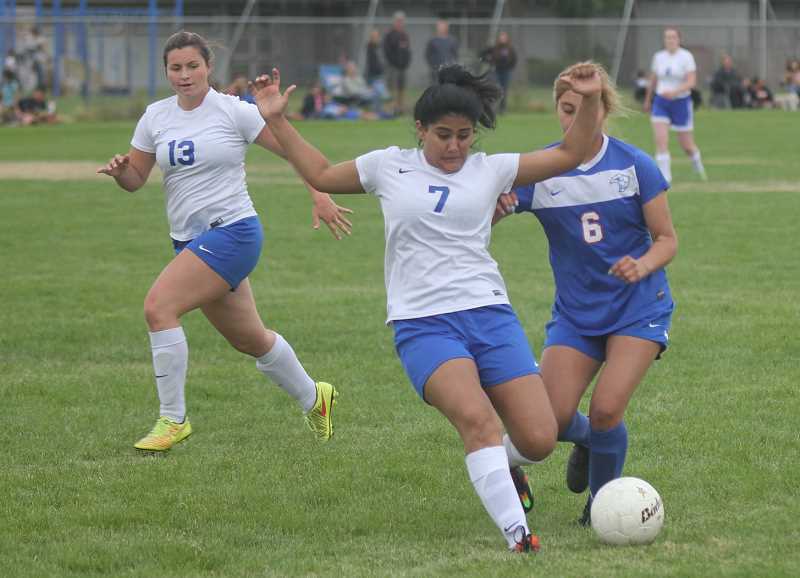 "It is our second game, and in the first game, we were awful," Crook County head soccer coach Rich Abrams said. "The first half they outplayed us — outran us, but the second half was pretty even. I was pretty happy of our turn around." Madras took a 3-0 lead into the half. During the 10-minute break, Crook County made several adjustments. Early in the second half, the adjustments appeared to work as the Cowgirls fought their way back into the match. "We made a few corrections, and once we did, the team got going," Abrams said. "I think in the second half at least we were able to hang with them." Five minutes into the second half, the Cowgirls finally scored their first goal of the year as Gracie Kasberger was able to break free and drive the ball into the back of the Madras net, making the score 3-1. Midway through the half, Shelby Squire scored to bring the Cowgirls to within a goal. However, the White Buffalos scored on a free kick midway through the half to make the score 4-2. "Our goalie went down with an injury, which caused at least two of those goals," Abrams said. After that, the Cowgirls seemed to play more tentatively. The White Buffalos scored one final insurance goal late in the match, making sure that the Cowgirls couldn't come back. "We passed the ball to the right people," Abrams said. "I think once we got the jitters out, we passed good. The first half we couldn't pass, but the second half, our middle centers started to click and started finding players, which made a huge difference." The Cowgirls return home to host Dallas on Tuesday, Sept. 4, beginning at 4:30 p.m. Following that match, the team has a week to prepare before hosting La Pine on Tuesday, Sept. 11 at 5 p.m. The team will not be at home again until Tuesday, Sept. 25, when they host Hood River Valley in the second league match of the season. "We will just keep at it," said Abrams. "Working on the little things; passing, getting open, things like that."